So have we had a fair deal or been fobbed off? The fate of the shipyard in Portsmouth is a major political debate. Miles O’Leary looks at each side’s argument. Centuries of naval shipbuilding came to an end in Portsmouth when BAE Systems moved the industry to Scotland. And with it came the potential for 1,000 jobs to be lost in what was seen as a disaster for the city and its maritime economy. The defence giant’s decision in October 2013 to shift its shipbuilding to the Clyde sparked a campaign by politicians, unions and dockyard workers who felt ministers should have prevented the shiphall’s closure and protected highly-skilled jobs. Questions were raised as to whether it was a political ploy to encourage the Scottish to stay in the UK and vote ‘no’ in the country’s referendum. Critics say it was shortsighted and the risk of the vote swinging in favour of independence would have seen UK naval ships being built outside its territory, an unprecedented move. But out of BAE’s decision came a number of new developments and steps forward for Portsmouth which otherwise may have never come to pass. In the early stages, a Solent Maritime Task Force linking the government, Ministry of Defence and the Solent Local Enterprise Partnership was created. Its purpose – along with a council-led task force – was to look at finding alternative work on the site and support those made redundant. Out of that came interest from commercial firms to build ships and separately, the vision of an America’s Cup headquarters in Portsmouth spearheaded by Sir Ben Ainslie to boost maritime opportunities in the Solent. A Minister for Portsmouth was also appointed and tasked with bringing new work into the shiphall as well as championing the city in parliament. Financial improvements also came in the form of a City Deal to unlock land to regenerate Tipner. City MPs and the leaders of the council’s political groups stepped up the pressure surrounding the shiphall by writing to David Cameron asking for his help. And the prime minister responded in a letter to The News by pledging to go ‘all out’ to ensure it had a bright future. And now following months of uncertainty, Mr Cameron has revealed Magma Structures and BAE Systems will take over the shiphall and bring in new work. But critics remain sceptical about whether shipbuilding will play a part in their work, whether new jobs are actually being created and what the companies’ long-term business plans are. Here, The News looks at each announcement made by the government in light of the loss of shipbuilding to determine whether it is all good news. THE minister for Portsmouth position was created to mitigate the threat to jobs at the dockyard and to find alternative work for it. Praise was heaped on Michael Fallon for his contribution and his work in bringing Ben Ainslie Racing to the city. But critics say the position has lost relevance under Matthew Hancock – and it is unknown whether the position will stay beyond the election. FOUR HUNDRED jobs are expected to be created through Magma Structures and BAE Systems’ occupation of the shiphall. But questions remain as to how many jobs will be created and how many will just move from Magma’s base at Trafalgar Wharf. MP Penny Mordaunt insists there is a programme to create 4,000 jobs at the dockyard in the next decade as demand for maintenance and refit work grows. A £420m contract has been signed protecting 450 jobs. The deal with Boeing involves the servicing of the Royal Air Force’s fleet of Chinook helicopters at the Vector Aerospace Fleetlands site in Gosport. But unions say the contract was always on the table - and it’s another example of no new jobs being created and the government not helping to bolster workforces. A CONTRACT worth £270m to upgrade Royal Navy torpedoes in Portsmouth was announced in December last year. BAE Systems won the 10-year contract to continue work on Spearfish Heavyweight torpedoes at its Broad Oak site in Hilsea. The move created 100 jobs at the site. But unions again said the deal largely protected existing maintenance jobs - and was already in the pipeline. THE government revealed 250 jobs were to be protected at the dockyard to ensure design work is carried out on the Royal Navy’s new Type 26 frigates. But Prospect union official John Ferrett has pointed out the engineers keeping their jobs were never part of the shipbuilding redundancy programme – and it was inevitable design work would need to be done on the new destroyers. 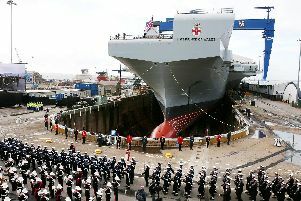 BUSINESSES have been picked to prepare the naval base for the arrival of the Queen Elizabeth-class aircraft carriers by the end of the decade. David Cameron made the announcement on the same day he revealed details about the future of the city’s shiphall. But critics say the news is old given the work was always going to be necessary – and no details have emerged of additional jobs. PORTSMOUTH was awarded a £50m City Deal in November 2013 which enabled MoD-owned land around Tipner and Horsea Island to be unlocked and used to create new jobs and homes. But Councillor Gerald Vernon-Jackson, Lib Dem leader, said at the time the deal was on the cards well in advance - and should not have been portrayed by the government as a sweetener to make up for job losses. PORTSMOUTH is now home to a £4m centre of excellence in the unmanned vessel industry. The centre is tasked with research into unmanned boats and submarines – and the market for underwater drones is estimated to be worth £9bn each year. But Ukip’s parliamentary candidate for Portsmouth South, Steve Harris, says there is no proof such a lucrative market exists in the UK or elsewhere. A MAJOR plus that came out of the shipbuilding loss was the government’s decision to contribute £7.5m towards the creation of Sir Ben Ainslie’s America’s Cup base in Old Portsmouth. While it did not provide work for the shiphall, the economy is to be provided with a huge boost, creating jobs in sailing. The city will also host the contest’s World Series events this summer and again in 2016. A £70m deal was revealed last May safeguarding 100 maritime jobs working on the navy’s Type 45 destroyers. The two-and-a-half year contract sustained engineering jobs in Portsmouth Naval Base as part of BAE System’s Maritime Services arm. But Prospect union official John Ferrett said at the time more long-term deals needed to be made so workers had a more secure future.